At Vision Fx we work with patients of all ages and with all types of eye care needs. We also perform pediatric exams and provide frames and lenses specially developed for kids. 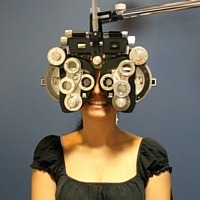 During our eye exam, we will perform a full examination of the visual acuity, visual performance and health of your eye. We use the most advanced equipment and technologies including automated testing equipment, computerized acuity testing and ocular imaging. Depending on your visual needs, we can prescribe contact lenses, including specialty lenses. We work with soft lenses, multifocal lenses, color lenses, gas permeable lenses and hybrid lenses. Click here to learn more about contact lenses. We diagnose and treat red eye, contact lens irritation, abrasions and other medical conditions. We provide screening, referral and followup care for your surgery needs. Our doctors receive constant training to make sure patients benefit from the newest and best options in refractive surgery. Click here to learn more about surgery co-management. Our regular examinations include a thorough analysis of cataract formation. When then time is right we work closely with your surgeon to make sure that your experience is as seamless as possible. Afterwards you can do your follow-ups right here in our practice. As your doctor we will advise you on the best course of action based on the most current clinical information. Click here to learn more about cataract co-management.